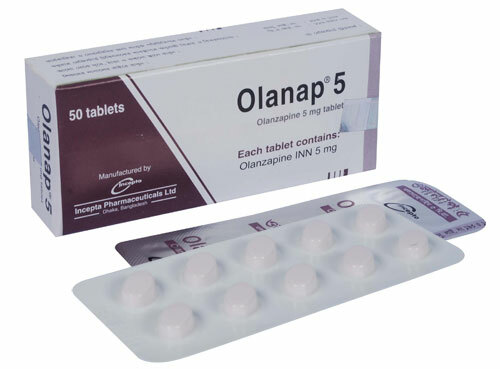 Olanap 5: Each tablet contains Olanzapine INN 5 mg.
Olanap 10: Each tablet contains Olanzapine INN 10 mg.
Olanzapine is a selective monoaminergic antagonist with high affinity binding to Serotonin 5-HT, Dopamine, muscarinic, H1 and alpha receptors. It has weak binding affinity to GABA-A, benzodiazepine and beta adrenergic receptors. The initial dose is 5-10 mg once daily. Daily dosage may subsequently be adjusted on the basis of individual clinical status within the range of 5-20 mg daily. Dosage greater than 10 mg daily only after reassessment. Maximum dose is 20 mg daily. Initially 15 mg once daily. Daily dosage may subsequently be adjusted on the basis of individual clinical status within the range of 5-20 mg daily. Dosage greater than 15 mg only after reassessment. Maximum dose is 20 mg daily. Olanzapine can be given without regard to meals. Gradual tapering of the dose should be considered while discontinuing Olanzapine. Very common undesirable effects are somnolence and weight gain. Besides increased appetite, elevated glucose levels, elevated triglyceride levels, dizziness, akathisia, Parkinson's disease, dyskinesia, orthostatic hypotension, mild and transient anticholinergic effects including constipation and dry mouth, asthenia, edema and photosensitivity reaction etc. may be observed. Precaution should be taken in case of impaired renal, hepatic, cardiovascular, cerebrovascular and respiratory failure, prostatic hypertrophy, paralytic ileus, diabetes mellitus, Parkinson's disease and in pregnancy. 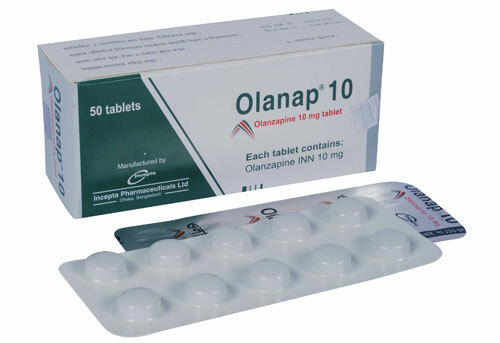 Lactation: Olanzapine is excreted in breast milk. Patients should be advised not to breast-feed an infant if they are taking Olanzapine.